Today is our last official day of sixth grade! Let the cheers begin. Yes, I know I had decided school needed to go one week longer. Yet after some consideration of our goals and our needs, we went back to the original end date. I came to this decision even after taking most of last week off. It's been a long couple of weeks here. 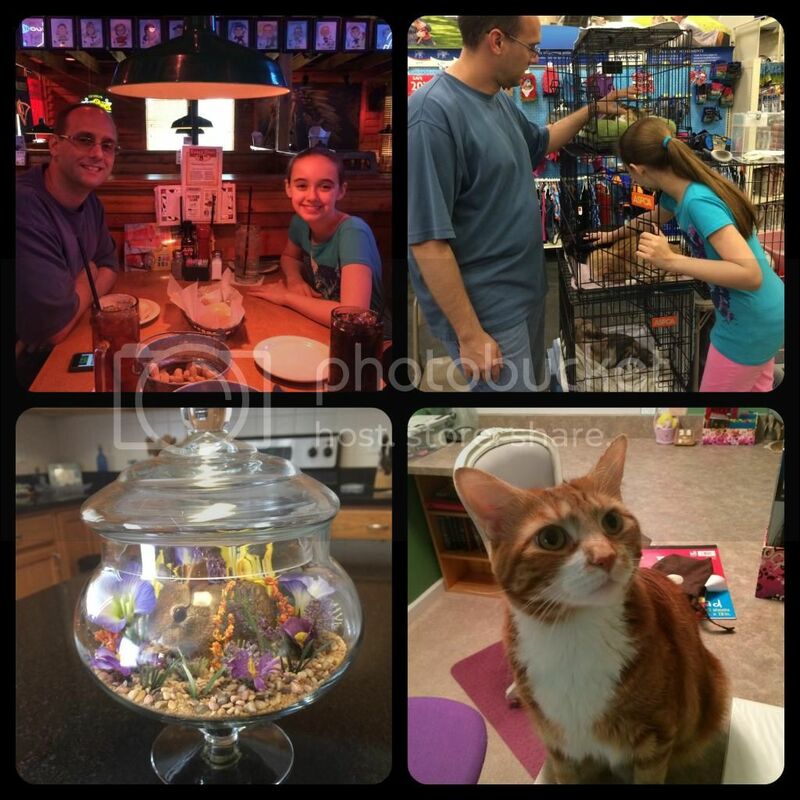 Last week we had quite a few appointments related to the adoption process. It became difficult to complete more than one subject a day in school with the time available. We also took Wednesday off entirely for my birthday, and to pick up our background checks from the police station. Fun birthday times. However, the impromptu time off helped me see how we can improve our educational structure. Homeschool group field trip. Little known fact... Amber took riding lessons for a year in 4th grade (she was even jumping fences), but this was the first time she had ridden since then. She promptly came home and took a nap because it was so exhausting. We started our homeschool journey halfway through fourth grade and it took a while to find our best path. Thus we felt a little short on middle school time for science. Our grand science plan had been to work through the summers and school years to complete logic stage Biology (check), Earth & Space Science (1/3 complete), Chemistry, and Physics in only three school years and three summers. Then we would start all over again at the high school level. However, I've realized these topics are not all necessary and with Amber's physical limitations lately it is somewhat unrealistic. Instead we are taking science off this summer(!!!) and will finish Earth & Space Science in 7th grade. One year of Physical Science in 8th grade is going to replace the full year each of chemistry and physics. No, this is not as in depth as our original plan, but our plan was no longer going to be successful and would only make science a drudgery. (TOP-LEFT) Fred and Amber at lunch. (BOTTOM-LEFT) Amber's birthday present to me. She designed and made this, with a glass top so the cats won't eat my flowers. (BOTTOM-RIGHT) Biscotti looking cute and being uncharacteristicly cuddly when others were around. To be honest, our original plan would have been more chemistry and physics than I had at that age. Not that my education was perfect, but having been in physics (and computer science), I can say that my future life as a scientist was not held back because I failed to take a year of physics in 8th grade. Actually, the broader physical science class helped me to see my true interests. Without that course I would have gone into meteorology instead of astrophysics. This summer Amber will still be working on her math that is behind but progressing well, while also studying the Philippines. That's all we will do for school. We've also briefly talked about lessons for 7th grade and over the summer will make some minor alterations of our plans. Our history will be revolving around the middle ages and I'd so much like to do more projects and activities than this year. Some of our changes will depend on the adoption status and how soon we might need to take some time off for the introduction of a new family member. At the jousting! The first joust we had to stand to watch. The second joust we had seats with the English court, in the shade. And one pic of the caber tossing. It was the Scottish weekend. We still prefer the classical educational model, but it doesn't always allow for the flexibility Amber now requires. I need to be able to buffer in time for projects while still having sick days, but it isn't working well with the time needed for the classical model, so the projects get skipped. We are going to have to develop a classical education lite version, or "classical education for the chronically ill who need some easy project based days." Sigh. It seems that as I get a handle on how to best educate Amber, the situation always changes. That's just life. While today may be the last official day of school for the year, we also have our full fledged Roman day planned for next week. Probably not until later in the week though. Our first home visit for the adoption is next week and I'm nervous about everything. I was doing good until I finished my parts of the psychological evaluation last week. I never want to take another personality test. No, I'm not some scary psychopath (I was a little worried... Isn't the crazy person the last to know? ), but I'm not sure I agree with all the results. I'm trying to be open minded though. However, I was quite taken aback and I had to bite my tongue when told that trusting in God during the difficult times in my life only seemed liked it worked because things came out alright. But that this was not a good way to deal with difficulties. Seriously? Additionally, I am a very positive person but have never had real problems to test that attitude. Again, this doesn't ring true. I'm actually a life long pessimist who is tired of viewing the world that way and fights to see the positive these days. Life has shown me that things can be bad, but usually not as bad as you fear it to be. (LEFT) Amber being a renaissance faery. (CENTER) Faery houses in the faery area of the Renaissance Faire. 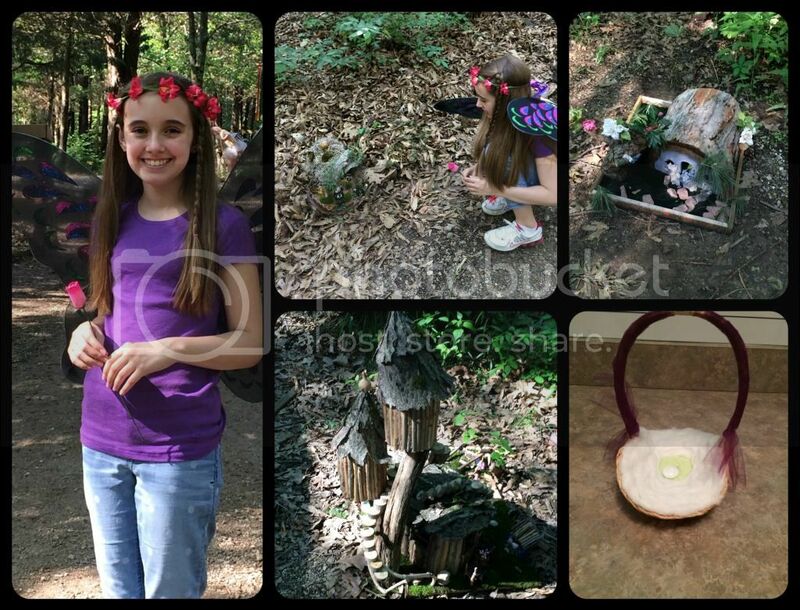 (BOTTOM-RIGHT) A "dragon egg" that Amber traded for with a faery. She has built it a little "nest" too. So, now I'm all kinds of nervous about the home visits and Fred's psych eval. I actually had a list of home projects to complete in under a week because I can't imagine someone inspecting my house without these projects complete. I'm sure most or all of them don't really matter, but they need to be done eventually and it makes me feel more secure to know they aren't still waiting. Thankfully Fred and Amber are pitching in and we are nearly finished. Now if it would stop raining long enough for me to finish the landscape trimming. 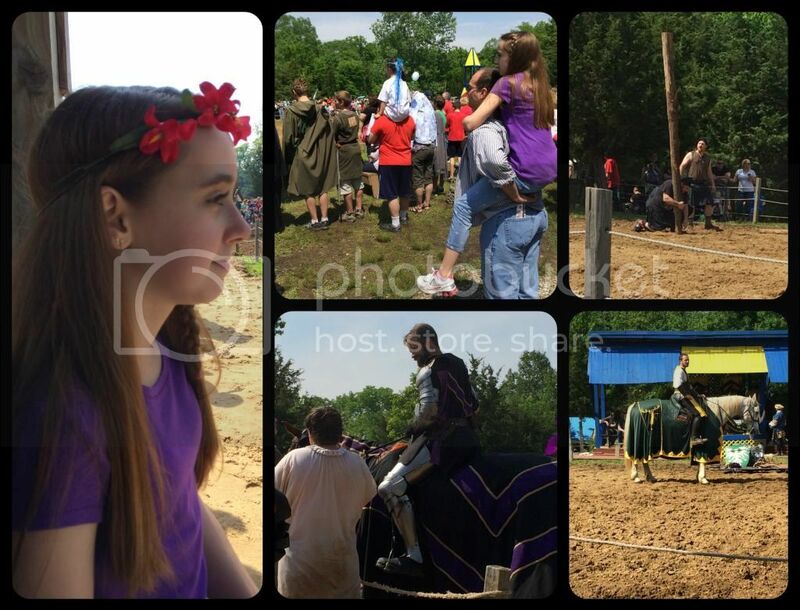 We did take time out over Memorial Day weekend to go to the Renaissance Faire. Since we are in St. Louis, it was actually a Frenchified faire, but there was still some English nobility and royals at the jousting. We even sat with the English court during one joust. 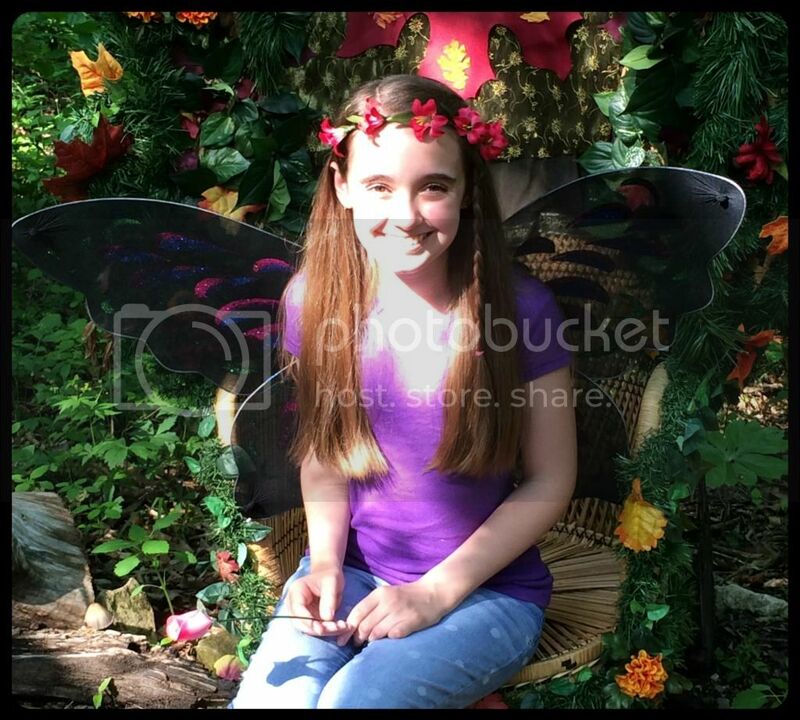 Amber loved every minute of her first Renaissance Faire, and we ran into several people that we know. It was pretty astonishing, really, given that this isn't a small town. So, today is our formal farewell to Sixth Grade. We are celebrating by getting up early, all of us trekking to the endoscopy center, and me having my every 5 year colonoscopy. Such an exciting way to end a school year. I think I will enjoy our celebratory lunch more than the rest of the family today. You have so much going on Christy!!!! 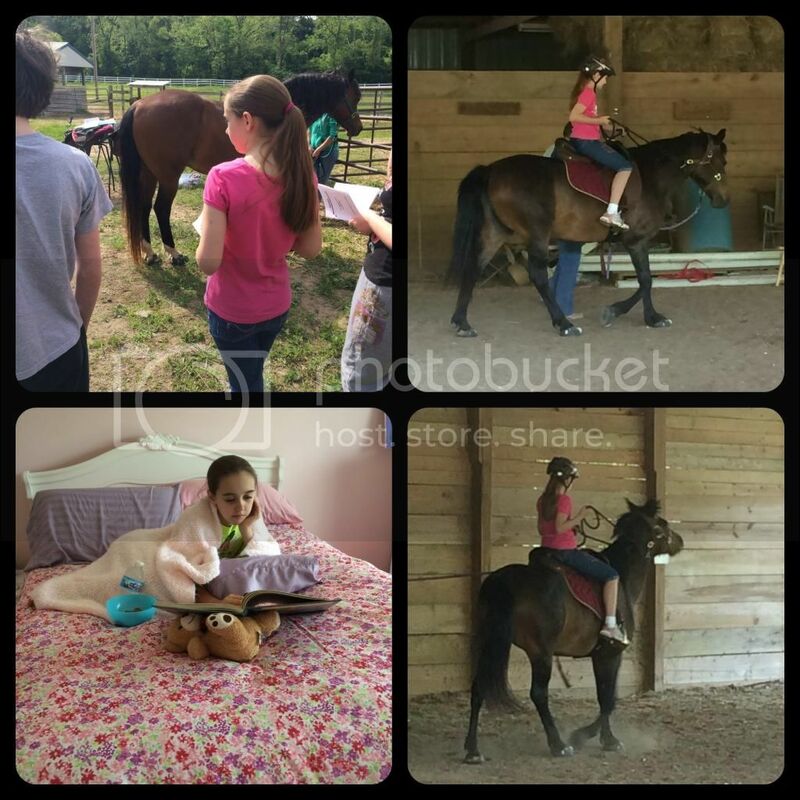 I love all the horseback riding pics with Amber. The Ren Faire sounds like such fun. We LOVE those!! I know you are nervous about the home visit but you are going to ROCK it. You and your family have so much love to give and Keilee and I pray for you and your situation every night. Hugs Christy to you and your girl. Isn't it great that with homeschooling we can change things around to best suit everyone's needs? I'll be praying for an excellent home visit and a smooth, quick adoption process! Getting everything ready and complete must be stressful. Sometimes Well meaning advice or "words of wisdom" from others is not supportive and we should just let it go in one ear and out the other! Sometimes trusting in God is the only thing we can do and Thank Him that we can! I think probably homeschool needs to change fairly frequently because the children themselves are changing, maturing along with their own specific needs. You're doing a grand job switching what needs to be switched. It's senseless staying on the same path just for the sake of it! I hope the colonoscopy is okay, you'll be in my prayers!